Commissioned by a large public transportation company, we upgraded the controller of an electric traction device that was developed for subway carriages made more than 10 years ago. Promwad engineers selected a new component base for the outdated platform and involved only one PCB instead of two, at the same time necessary functions and size remained. Software adjustments were minimal. As a result of the project the customer was able to reduce costs for mass production, and could use modern electronic components. A research and production company. As a contract manufacturer of electronics, it launches production and contract assembly of complex modern electronic devices. Upgrading the current hardware platform of the electric traction drive controller developed over ten years ago, with new electronic components. All the functionality of the updated platform should be implemented on a single printed circuit board (PCB) with minimal software adjustments. The upgraded platform will be used both in subway cars and other developments for the transportation industry. The objective of the project is to upgrade the existing hardware platform of the controller, while preserving the original functionality in accordance with the customer’s requirements and source schemas provided by the customer. Dual-channel static RAM with a total capacity of 64K×16 was used for data exchange between the controllers. The memory model integrated in the source schema was no longer manufactured and not available for purchase. The transition was made to the base size of the 0402 passive components to reduce the chip size. 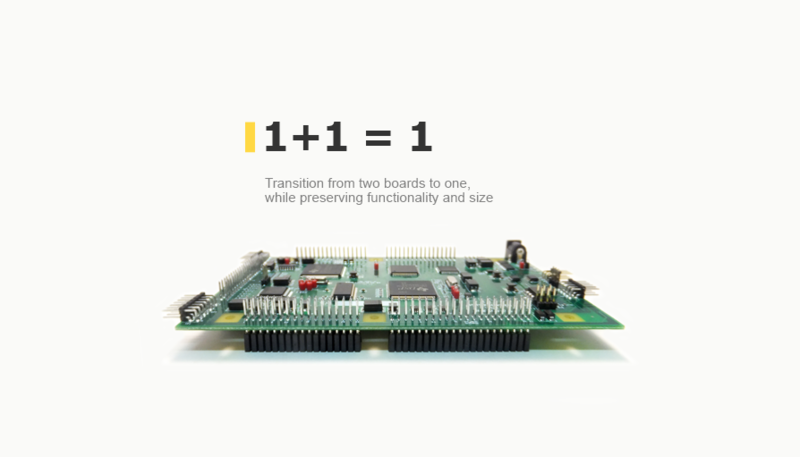 The project of redesigning the hardware platform of the controller designed as two separate PCBs involved the development of a single-board CPU with the same functionality. When the design process was completed, a set of design documentation was developed for manufacturing and assembly of the CPU printed circuit board.